The results are in, and today's fruit is the cupuaçu! A few weeks ago in Salvador I ate a chocolate filled with cupuaçu. It was tasty, but mixed with the chocolate it was hard to taste the fruit's flavour very distinctly. There was frozen cupuaçu pulp at the supermarket, but I never bought it, mostly because I could never resist the strawberry pulp. I was also kind of holding out for the fruit itself, but had mostly given up until we passed a fruit stand right here in Brasília with a whole stack of these monstrosities. 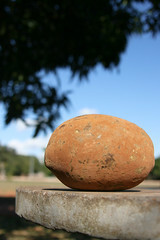 The cupuaçu looks like a huge potato, and it's outer shell is very, very hard, like wood. When we bought it, the guy at the fruit stand mimed for us how we should crack it open against concrete. We carried it to the park with us, and after we'd had our fill of jabuticabas, we decided to crack open the cupuaçu. The insides looked like BRAINS!, only smoother. It separated pretty naturally into two sections where the seeds were held together by really light yellow, dense pulp. We dug right in and were both very pleasantly surprised: Cupuaçu tastes like mild lemon custard, with a texture similar to that of our beloved pinha. It's delicious! We found the pulp furthest from each seed to be the sweetest, and it was more vinegary closer to the seed, so we mostly stuck to the edges. We polished off half of the fruit before packing up the rest in its own handy carrying case to bring home for later.